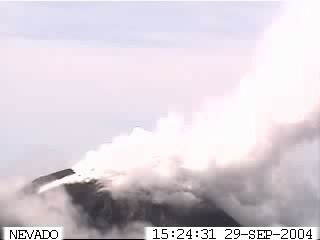 Volcan de Fuego or Volcan de Colima, which is 200 m lower, and is situated 5 km S of Nevado. Approx. 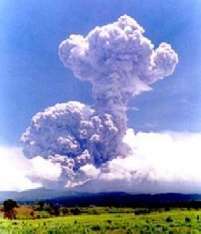 300.000 people live within a 40 km radius from the volcano. 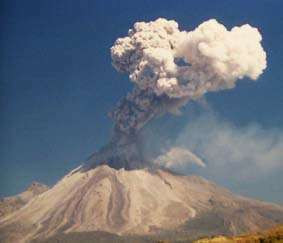 Colima is considered the most dangerous and active volcano in Mexico. 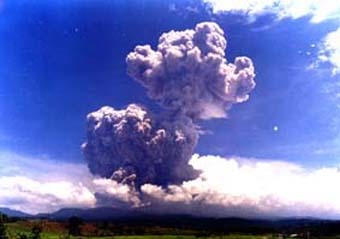 The last big eruption was in 1994, when several 'bombs' caused big fires in the neighborhood. 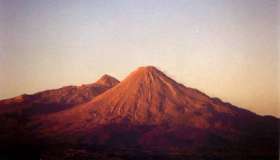 Antonio and Monte Grande ravines, at distances considered preliminarily between 4 and 5 km. 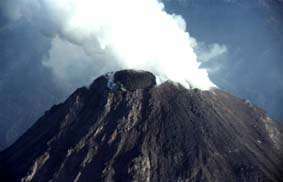 flows by South, the West and North flanks of the volcano, and they reached about 3 kilometers. above the crater. Ash fall has been reported in City Guzmán, Jalisco and populations nearby. like the 1999 type or greate,r that can cause a landslide. reached ~2 km from the summit. up from the crater. 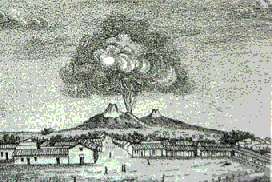 In the middle: The ash-column following such an explosion. 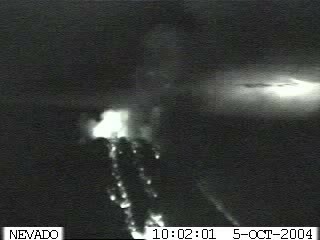 the Northwest, the West and the south because the lava emission in blocks continues. 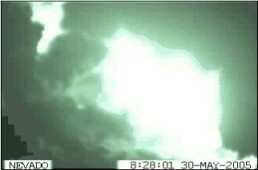 Following report was issued at noon, yesterday, local time. The lavafront on the North flank is at least 1200 m of length and 150 ms wide approximately. The lavafront on the NW flank is at least of 400 ms length and 200 m wide. The landslides, which all come from the western lavafront, stay in the rank of up to 2 km from the top. 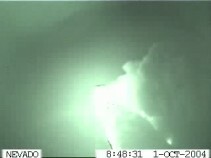 During the last 24 hours there have been registered 23 small explosions. 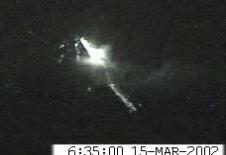 lava emission partly in blocks, continues. The flow on the South side has increased. 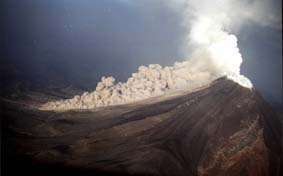 The lava front on the North flank, reaches approximately 600m of length and is 150 ms wide. 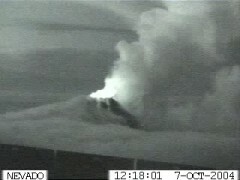 The lava front on the WNW flank has reached 250 ms approximately. 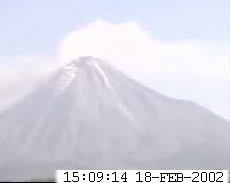 and great activity of degasificación is reported. The landslides have come as far as up to 2 km from the top. 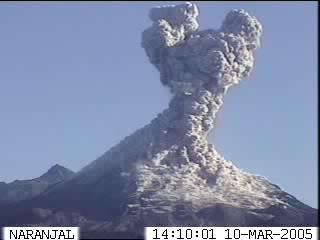 Colima is still busy letting off the pressure by emitting vapour and lava. 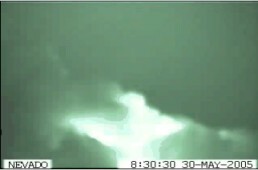 Pictures taken are dated in GMT. Norway/CET + 2 hours. 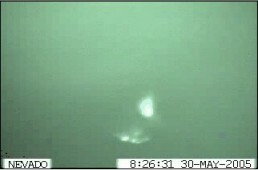 the flanks have been registered, to the Northwest, the West and the South. 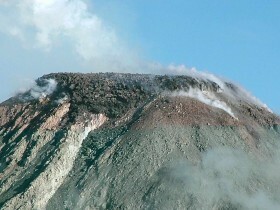 The lava front on the North flank, reaches approximately 350m of length and is 150 ms wide. Friday, October 1st. 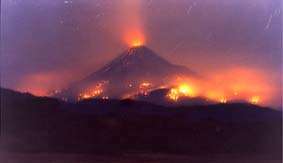 A wide stream of lava had been clearly visible at night flowing down the volcano. 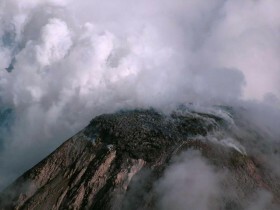 dome that covers Colima's crater. 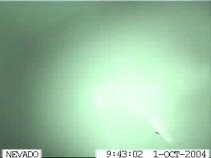 Smoke and gas are now emitting from a crack in the dome. 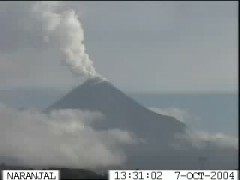 It is hoped the lava flows continue, relieving pressure inside the volcano. 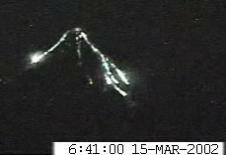 flanks on the volcano, numbering in the last 24 hours to a total of 209.
approximately five times greater than the previous ones. western side and throughout the day they have been increased in number and size. 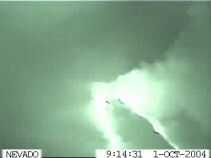 Looks like two flows are running down the slopes - then a new explosion? 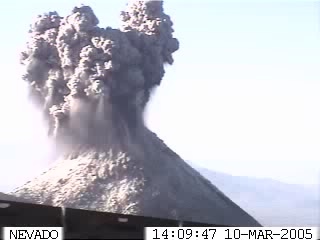 the increased activity at Colima. crater of the 12-thousand-533-foot volcano. at the University of Colima. 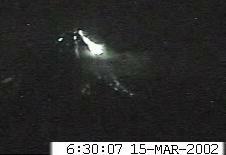 on yellow alert, which bars people from within four miles of the volcano's crater. 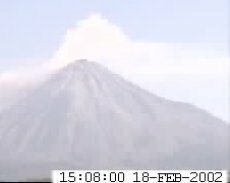 As usual - Colima is having a short periode of erupting gas and vapour. 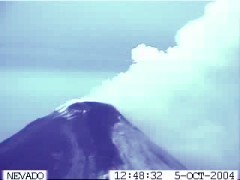 VAAC reported that on 6 September at 1026 a strong ash emission occurred at Colima. 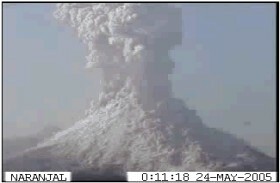 The resultant ash cloud rose to ~6.7 km a.s.l. 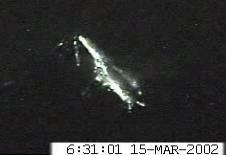 and drifted N. Ash was not visible on satellite imagery. 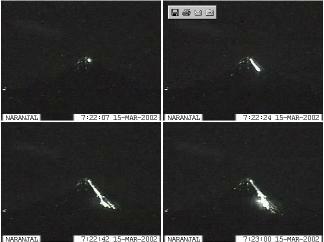 Another ash emission occurred on 8 September that was visible on the Colima video camera. Wish to run ahead of the strem? One minute between the snapshots. 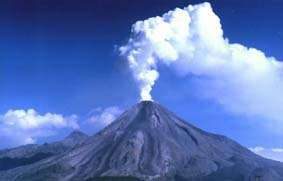 During the past 500 years the Colima volcano has had a frequency in eruptions at about 30 years.